Why should you buy an apartment in Purva Eternity? Have you ever thought of getting a home in the backwaters of Kerala? Well, have a look at Purva Eternity, one of the finest abodes for home-lovers. You can enjoy a perfect blend of heritage and charm in the residential estate. Kerala is known for its natural beauty. When you get a luxurious home amid the ageless natural setting, you can enjoy your housing aspirations in the truest sense. The luxurious apartments present the best thing a housing aspirant can expect. The vintage landscape will sway your mind when you shift to the tradition-inspired residential complex. Located close enough to the city, you can enjoy all the necessary amenities here. Every element in the complex, right from the swimming pool to the stepping stones has been designed according to the prevailing heritage of the place. You can enjoy your time around the bio-pond and a water feature, besides a fountain and a pool to add to the beauty. The luxurious setting has statues of Gods and nymphs. In a nutshell, you will get the taste of the age-old tradition of Kerala. Easy transportation facilities and the availability of all the necessary amenities have led to the popularity of Purva Eternity Kochi. The location of the residential estate is optimal, close enough to the commercial areas. Besides, a number of IT companies have come up in the area. These include Muthoot Technopolis, CEPZ and Apollo Tyres, among others. Besides, the area is close to a number of schools and hospitals. You will find no dearth of entertainment facilities. People living in the apartments will get easy connectivity to all the shopping malls and multiplexes in the area. Located in Kakkanad, the luxurious residential estate provides you with an opportunity to enjoy the bliss of life, with aristocracy and luxury. Apart from this, people living in these apartments can get access to the Kakkanad Collectorate Junction, which is just 2 Kms. away from the estate. Besides, you can easily reach the N.H Bye Pass Junction and Wonder La water theme park, both of which are located 5 Kms. away from the residential estate. 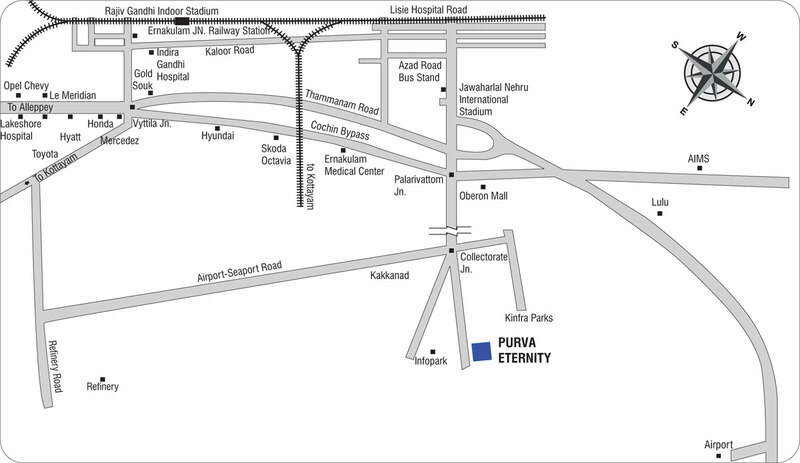 The optimal location is one of the reasons leading to the rise in the Purva Eternity Price. You can invest in the property, which is likely to yield high returns. You can also get an apartment for personal use and enjoy luxury and comfort. The security system of the residential complex is of international standards. The area remains under CCV coverage 24/7. Apart from these, the fire protection system and gas detector add to the safety measures. In terms of liveability, Kochi is one of the best cities in India, presently placed in the sixth rank. It is wise to invest in the property in Kochi. The city is also emerging as a commercial hotspot, with around 90,000 vacancies awaiting the employees in the next few years. 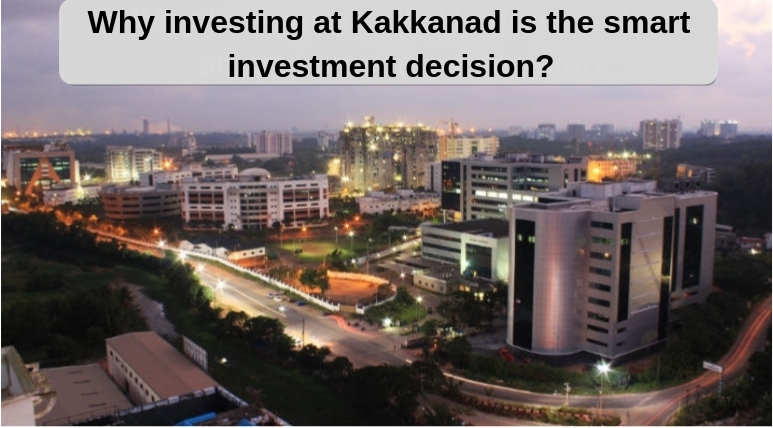 This is the best time to invest in the property in Kochi. Get a cultured lifestyle amid the traditional surroundings here. Purva Eternity Kakkanad – Ultimate lifestyle, high-end apartments and supreme luxuries! Opulence, quality construction, luxury and peace of mind, these four elements are enough to enjoy a sophisticated modern lifestyle. A glorious construction, Purva Eternity Kakkanad has the presence of all these great factors and constructed under the supervision of the prestigious Purvankara Group, this is the true destination of pure luxuries and supreme modern comforts. The company has achieved its position among the top rankings in the real estate market and their continuous efforts of perfection and dedication in each of their projects have placed them well ahead of the other competitors in the market. This time with the project in Kochi, they once again have proved themselves superior by installing here the best-possible amenities and great quality of interiors in the modern apartments Imagine a lifestyle here which will begin with the most convenient and pleasant morning and end with the luxurious and comfortable night.